If hunting Alabama whitetails in the snow seems strange to people, imagine how winter weather short circuits a southern buck’s brain. Those were exactly the cards Brenda Valentine, RedHead Pro Hunting team member, was dealt. 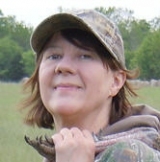 See how she copes with these whitetails gone wild by watching King of Bucks television, which airs on The Outdoor Channel Saturday, Sept.6 at 9:30 a.m. Eastern time. Also, RedHead Pro Hunting Team member Allen Treadwell puts the latest gear through the wringer so you can see how it will perform on your hunts. And, next time you’re aware of a trespasser, use these sensible tips from RedHead Pro Hunting Team member Bob Foulkrod to deal with the situation. Lastly, feast your eyes on the racks that make the exclusive 200 and above club. This week’s Tales of the King is dedicated to the biggest mounts in the Bass Pro Shops King of Bucks Collection.